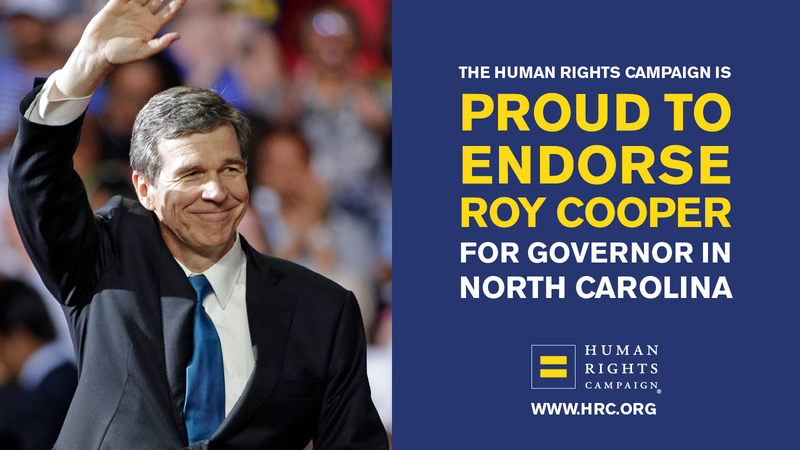 Today, HRC and Equality NC announced both organizations have endorsed Roy Cooper for Governor of North Carolina. The endorsement comes one day after Donald Trump and Pat McCrory campaigned together in North Carolina and a month after news that Gov. McCrory and his allies have earmarked $500,000 in taxpayer funding to defend HB2 in court, even though it is opposed by fair minded North Carolinians and more than 200 major business leaders and CEOs, many of which lead the state’s largest employers. Polling in North Carolina has found that voters have consistently rejected HB2. An August Public Policy Polling survey found that a 58 percent majority think HB2 is hurting the state’s economy. Only 30 percent support HB2 while 43 percent oppose it. A CNN poll this year found that nationally, 57 percent of Americans opposed laws like North Carolina’s HB2, while 75 percent of Americans said they would back laws that guarantee equal protection under the law for transgender people in jobs, housing and access to public places. While Donald Trump has embraced Pat McCrory’s discriminatory HB2, a host of Republicans around the country have declined to follow suit. Republicans like Nikki Haley, Chris Christie, Dennis Daugaard, Mark Kirk and Rob Portman have all declined to follow in the footsteps of Pat McCrory and have either spoken out or vetoed anti-transgender bills that write discrimination into state law. Despite widespread opposition to HB2, Governor McCrory continues to double down in reckless defense of the deeply discriminatory law that bans transgender people from accessing restrooms consistent with their gender identity in government offices and schools, and removed the ability of municipalities to pass LGBTQ-inclusive non-discrimination laws and minimum wage ordinances. McCrory has a long history of opposing LGBTQ equality. Prior to being elected Governor, he defended a gym in Charlotte that denied service to a man because he was gay, he repeatedly voted against local non-discrimination measures and he once suggested that rather than holding public parades, LGBTQ Pride festivals should be hidden away in hotels. In the more than four months since Governor McCrory and state lawmakers rammed HB2 into law, the economic fallout has continued to grow as companies concerned with protecting their consumers and employees have moved conventions, trainings, operations, productions and other events out of state. Citing the hostile environment created by the state’s HB2 law, and after repeated warnings the league would move the event if the law remained on the books, the NBA recently announced it was moving the game out of Charlotte after state lawmakers failed to repeal the measure. HB2 has cost North Carolina $329.9 million in lost economic activity, including an estimated $100 million in economic development that will be lost because the NBA has relocated the 2017 All-Star Game outside the state. The Human Rights Campaign is America’s largest civil rights organization working to achieve equality for lesbian, gay, bisexual, transgender, and queer people. HRC envisions a world where LGBTQ people are embraced as full members of society at home, at work, and in every community.